Bantam Aire is Kasco’s line of small, shallow, water pond and lake diffused aeration systems. It works on the same type of principle as Robust Aire, where it uses a compressor, pushing air through a diffuser head and as these bubbles rise through the water column, they carry water from the bottom up to the surface, but it is designed for these smaller, shallow water ponds and lake areas. It uses a linear diaphragm compressor instead of piston compressors that are used in Robust Aire along with using weighted tubing and one of two different sized diffuser heads which are going to be a different size and of different shapes but made of the same material. Also, if there is more than one diffuser head, there will be a manifold with it as well. So, why is Weeders Digest offering Bantam Aire? The main reason is that it is perfect for certain ponds and lake areas that other products just didn’t address very well. It offers very minimal surface disturbance which some customers want because they don’t want a lot of stuff at the surface splashing or they might not want fountain displays. It has a very simple and user-friendly design. There are a lot of ponds and lakes out there that could benefit from some sort of aeration that’s inexpensive to purchase and operate and is very quiet to operate, so, that’s where Bantam Aire really shines, it really fits a need in the market. Increase dissolved oxygen levels, promote fish health and productivity, improve overall water quality. Bantam Aire will work best with water gardens, or any water area up to about a half acre or less, where the Robust Aire systems are just too large or too expensive for the customer’s budget. The main limiting factor on these is going to be the depth; these compressors are pressure-sensitive and the depth is the key factor here so depending on the size system, we are talking six feet or less with these. They are perfect for the do-it-yourself homeowner because they are very easy to purchase, assemble, install and operate, they can be assembled and installed and have these running in the same afternoon. Deter algae growth, stabilize pH levels, reduce alkalinity, and remove carbon dioxide and phosphorous levels. Why would you look at Bantam Aire versus a surface unit aerating system? First off, it is going to be the price, Bantam Aire is priced very inexpensively for these small ponds and lake areas, especially when you are thinking of using a half horsepower in a pond that’s around a tenth of an acre. In this case, Bantam Aire is going to be very cost-effective. Next is the sound, even though there is no motor sound coming from the surface aerator, there is that splashing of the water and Bantam Aire is not going to have that splashing, you will have very minimal sound coming out of these compressors. Surface disturbance is another one, very minimal surface disturbance, sometimes with these small ponds and lakes, customers don’t want something splashing and they don’t want a fountain display out there, so Bantam Aire is a good option there, with a very low operational cost; it will be a fraction of the price to operate this compared to larger fountains. Many small ponds just don’t need as much oxygen as what even the smallest surface aerating unit would create, so these would fit a niche that even the current smallest unit would not address very well. If you are looking to provide aeration to a larger body of water, look at our Airstream Pro by Weeders Digest. This breakthrough technology brings jet aeration and high volume circulation together to provide one high quality system. Efficient, effective and developed specially for increasing the circulation and oxygen throughout water to reduce aquatic vegetation, improve water quality & keep the life within alive and in good health. If you have a small lake or pond area, the Kasco Marine Bantam Aire Diffusers Aeration System is for you. 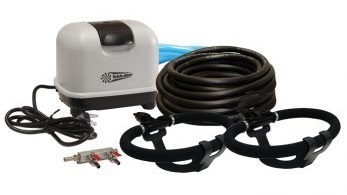 The overall benefits of the Bantam Aire are the following; first you have the compressor, these are going to vary in size, depending on the system, and all of them are going to be very quiet, efficient and cost effective and you can put rubber feet on them to absorb some of that vibrations to keep them even more quiet. They have stainless steel clamps for easy installation. They produce very high flow with minimal electrical input and probably they have an enclosure included on them that make them stand up to a lot of outside environmental issues like change of season and weather very easily. Keep in mind that if you do put these outside, you’d want to have some sort of roof over it to keep the weather off of it as much as possible but it’s not like a piston compressor where you need to have that nice, clean, sealed up pump house with good ventilation, that sort of thing, it can withstand a little bit more of the rough environments. Also with the Bantam Aire, you are going to have the diffusers with these, available in two different sizes, a small one at 27 inches or the large at 39 inches and it is going to be made of the same material as most Aire diffusers are made of. The base is a little different, it’s a self-weighted, coated, stainless steel base which makes assembling and installation easy, you just pop it there, throw it in the pond or lake, down the bottom and it sits in there.